Christmas means goody boxes. I started about 8 to 10 years ago of giving baked goods as gifts for Christmas. It takes about 2 days of baking. I usually do six to eight different items each year. This year I had seven items. The first item was a no bake chocolate fudge cookie with oatmeal and coconut. The second item was a mini pecan pie. 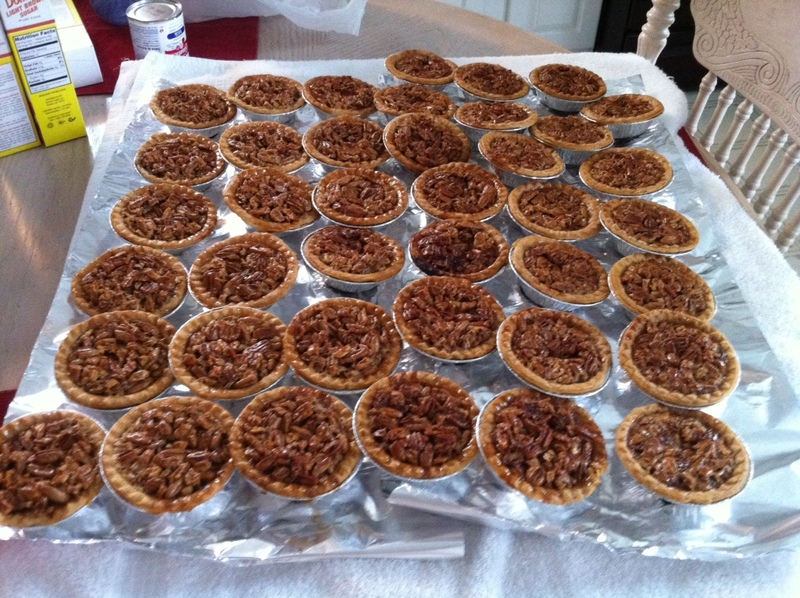 The mini pecan pie is a big favorite. I think the secret ingredient to the filling in these pies is a sifted teaspoon of corn starch. The corn starch helps set the pie and alleviates the problem of having runny pecan pies. I use the mini tart shells that come eight to a box. Stir in first seven ingredients thoroughly using spoon. Then mix in pecans. Then fill in tarts and put them on a cookie sheet covered with aluminum foil. Bake at 350 degrees for 40 to 45 minutes on middle rack of oven. Pies will rise a bit. So don’t panic. One recipe usually fills about 12 to 16 pies. You might have to add some more chopped pecans to finish all of the filling. A recipe for filling fills one regular 9-inch pie shell. 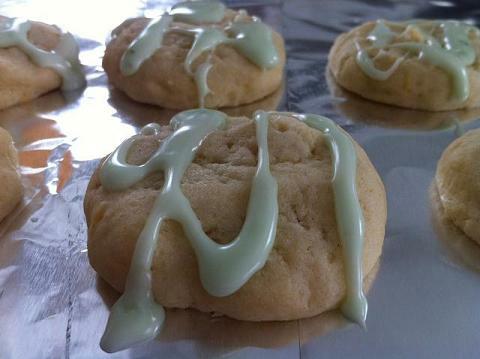 This lime cookie has become very popular. It is so light, and the fresh lime zest and juice gives it that fresh lime punch. I think the goody boxes were a success. If you’re in the mood for seafoodstuffed eggplant, which is paneed eggplant with crabmeat topped with a seafood cream sauce go to Harahan, La. on the outskirts of New Orleans. You can go to Charlie’s Restaurant on Jefferson Highway. The restaurant is owned by renowned chef Frank Brigtsen. Only on Friday, at Charlie’s the lunch special in the $15 range is paneed eggplant with crabmeat stuffing topped with a lemon seafood cream sauce studded with a few sauteed shrimp. This dish is very filling but so delicious. If it’s not Friday and you have a craving for this dish, do not fret. About ten minutes from Charlie’s is Seither’s Restaurant. They have an appetizer called Eggplant Harahan. For $8 to $10, this dish has the paneed eggplant with the crabmeat stuffing topped with a seafood cream sauce. The dish can easily be your lunch. I find it a bit lighter than Charlie’s version, but both are delicious. You can’t go wrong with either version. Enjoy!